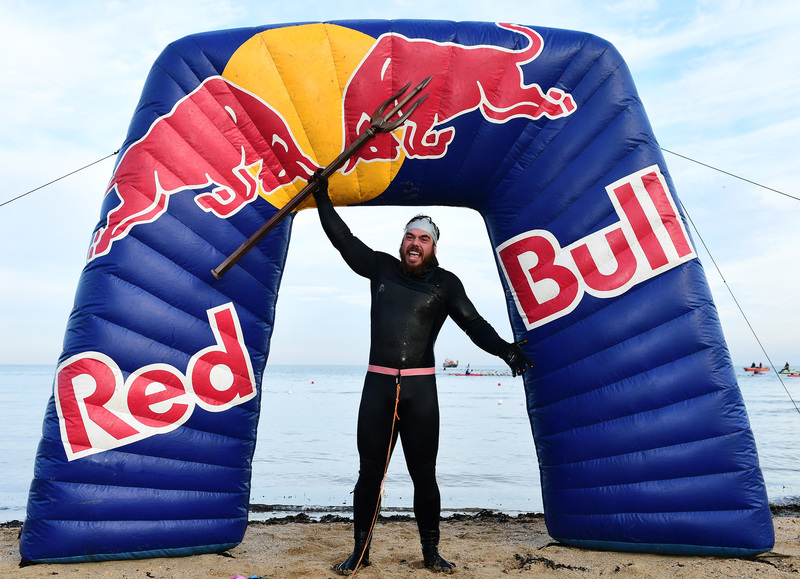 Ross Edgley has taken on a number of challenges in his life, but making history as the first person to swim all the way around Great Britain was his biggest yet. After studying sport at Loughborough University, Ross became a strength and conditioning coach, however it wasn’t long before he decided he wanted a change of pace, and he set out to discover exactly what his body could achieve when pushed to the extreme. His first mind-blowing challenge came in the form of a marathon. You might be thinking, ‘okay, a marathon, that’s not that impressive’. Of course, that’s exactly what the athlete thought too, so he decided to add a little something more to his endeavour. Speaking to UNILAD, Ross explained how he decided to take on a big challenge to raise money for the Teenage Cancer Trust. Sitting around a table with his fellow Loughborough University pals, the group spitballed ideas about what Ross could do. Someone went ‘run two marathons’, and I was like ‘no, again, people have done that. That’s no big deal’. Dubbing the challenge the World’s Strongest Marathon, Ross trained for the mammoth task by stepping up his calorie intake and doing the only thing that could really prepare him; running around with a car in tow. I lived in Chester, so I was running around Chester towing a car on the back roads. Ross completed the epic marathon in 19 hours and 36 minutes, but he wasn’t finished testing his body yet – not by a long shot. After successfully climbing the height of Mount Everest on a rope in 2016, in 2018 Ross decided to take on the Great British Swim, a 157-day challenge which saw him swim 2,883 kilometres around the entirety of Great Britain. The Great British Swim took all the principles of sports science, but it applied it into a completely different realm. Everyone goes ‘oh swimming, yeah I know swimming’ – yeah, in a pool, which is nice. Or maybe even a lake. Or with open water swimming, you maybe swim a mile off coast. Certainly not in an arctic storm around Cape Wrath, one of the gnarliest headlands in the world, getting smashed in the face by jellyfish and an arctic storm. But it was weird that it really appealed to me, taking all the principles of sports science, but you just apply it to adventure and exploration. You can swim 10k. Right, you can swim 10 miles. Can you swim 2,000 miles? Let’s see. It’s testing those principles but just to a silly extreme. I think that’s what I quite liked… to challenge what we thought the human body was capable of. Ross explained how he took inspiration from Captain Webb, the first person to swim the English Channel in 1875. 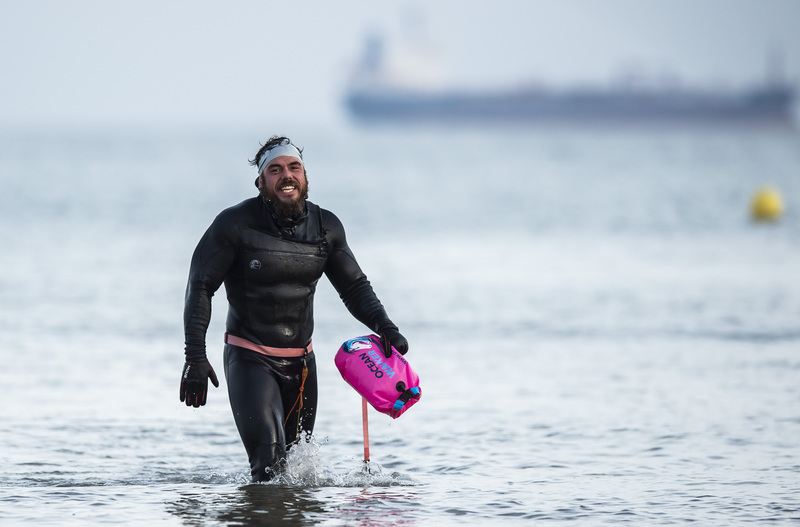 Webb was told by many people his swim couldn’t be done, but, wearing a woolen wetsuit, he successfully made it across the channel in less than 22 hours. People had similar doubts about the Great British Swim, with Ross explaining how the sailing community pointed out all of the hardships he’d come across on his route. 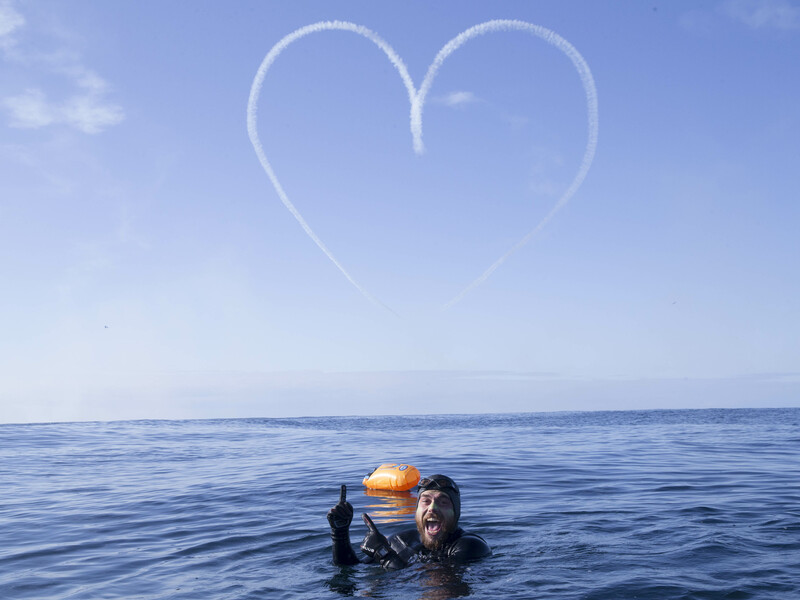 In swimming around the coastline, Ross would have to face changing tides, a giant whirlpool in Scotland called the Corryvreckan, and Pentland Firth, where the currents reach up to 11 knots. Apparently if he was to attempt to swim that strait at the wrong time, he could have ended up being propelled backwards at the speed of a dolphin – which would certainly have set him back a bit. They just didn’t think it could be done, and I was like right, that feels like Captain Webb. In order to achieve his mission, the 33-year-old sought the advice of someone who knew the sea like the back of their hand. Many recommended Captain Matt Knight, who’s been sailing for over 40 years. After meeting over breakfast one day, Ross and Matt shook hands and prepared to take on the ocean surrounding Great Britain together, with Matt keeping track of the changing tides and informing Ross of when he had to get in the water, and how long for. The Great British Swim was the longest ever staged sea swim; Ross didn’t set foot on land for 157 days. Either he was in the ocean, swimming his way around our island, or on the boat resting, eating and preparing for his next dip. To fuel the swim, Ross put away around 10,000-15,000 calories a day, shoveling in pasta, shepherd’s pie, Cornish pasties, noodles, porridge… you get the picture. 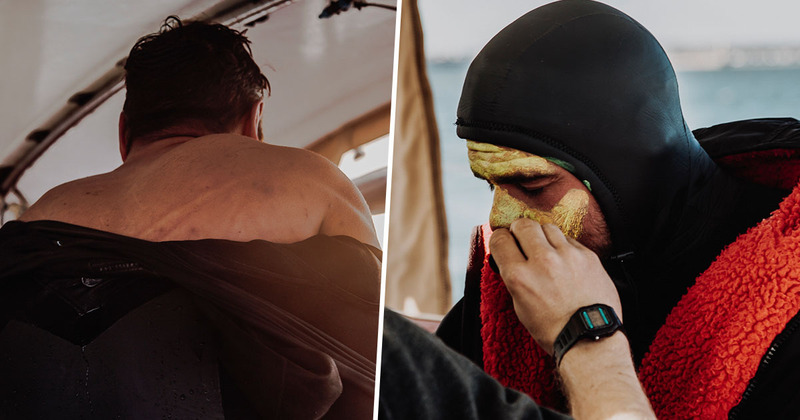 The athlete told UNILAD how the toughest part of the swim took place about halfway through his huge feat, when it came time to overcome the Corryvreckan. He explained how four hours in to a six hour stint, he was stung by a jellyfish. Having spent weeks in the ocean, this wasn’t anything new – in fact it was about the fifth giant jellyfish he’d come across that day. I remember this felt different, and it was searing into my skin almost like a hot poker. Like someone was holding a hot poker to your face, that’s how it felt. Due to his proximity to the threatening whirlpool, Ross had no choice but to keep swimming. After a while though, the pain proved too much – which is really saying something, considering he’d already dealt with the hardships of swimming in the ocean day in, day out. It turns out the jellyfish hadn’t simply stung Ross and made its getaway; its tentacle had got tangled in his goggles, and it had been hitching a ride on his face for about an hour. For those of you wondering, no, he couldn’t see the creature. He probably would have dealt with the situation much sooner if he had. After realising what had happened, Ross removed the goggles and unhooked his guest, but he’d been stung so badly that the goggles no longer fit on his swollen, tender face. Of course, that wasn’t the end of his problems. I put the goggles around my face and I punched them into my face so they would seal. I swum, finished the six hour time, managed to get free of the clutches of the Corryvreckan, and… Matt went ‘yep, good job mate, tide changes in six hours, see you back on deck’. The athlete described how he was surprised to learn how accustomed he became to pain and sleep deprivation; there were times when his tongue was ‘falling apart’ from the salt water, and his neck was ‘hanging off’ as a result of the wetsuit chafing on his skin, but he had no choice but to stay committed to his task. I’d wake up at 2 o’clock in the morning, I’ve got to go in and swim… and the bedsheets would have fused to my neck, with the open wound. So you definitely didn’t feel at your best, you felt at your worst but you had to perform at your best. What surprised me is how feral you become, but in a good way if you learn to embrace it. While the whole experience was definitely trying, Ross emphasised it wasn’t all jellyfish, whirlpools and pain. He also revealed his best moment of the swim, when a minke whale surprised him in the Bristol Channel by breaching right next to him. The whale stayed by him for about 12 miles, seemingly playing with Ross as it circled him and blew bubbles in his face. I’ve never seen this before in 40 years of sailing, but what I think is happening is I think that it’s a female, and I think she thinks you’re an injured seal, or an injured whale, because she’s guiding you towards wales where the water gets a little bit shallower. Sure enough, as both human and whale got close to Wales, the animal bid farewell. The minke whale breached one more time, this huge breach, as if to say ‘you’re safe now, there you go’. It was amazing, it was unbelievable. On November 5, 2018, 300 people joined Ross in the water to accompany him back to the dry land of Margate, and the swim was complete. His achievement earned him three World Records, for the first person to swim the entire south coast, the fastest person to swim from Land’s End to John O’Groats, and the world’s longest staged sea swim. Ross explained how the Great British Swim taught him to treat his body as ‘an instrument, not an ornament’, so although he emerged from the water looking like a ‘chubby, sea-dwelling Santa Claus’, he didn’t mind, as that was the body he needed to achieve his goal. While we’ll probably never be able to truly appreciate how tough the Great British Swim was, Ross is giving audiences a chance to get a taste of what he went though in the live show the World’s Fittest Tour, which kicked off with two February dates ahead of a UK-wide tour which starts in May. At the show, audiences are able to hear Ross’s stories, as well as get involved in some of the challenges he faced when training and taking on his mammoth task. We’re going to be doing live experiments on stage. There’s never really been a tour like this, but I think when you call it the World’s Fittest Tour you’ve got to give something to back it up. Ross found many people asking him what it was like to swim in the dark; an experience he’ll be able to describe with actions rather than words as he runs around darkened theatres with a Super Soaker, with sea noises playing in the background. He’ll also be demonstrating adversity training by putting some lucky audience members through workouts on stage, and challenging people to try and eat a certain amount of calories while simultaneously attempting to burn them off. I don’t think there’s any chance of anyone falling asleep in that show! Ross hopes people will leave the theatre thinking differently about both the human body and their own potential. Hopefully they can find their own Great British Swim, or their own Captain Webb. Ross’s incredible achievement proved there’s no limit to what the human body can work through when given a challenge – as long as we put in the effort to accomplish it! For all its hardships, the Great British Swim was truly inspirational, and Ross did an amazing job in completing it.